Waiting out the long winter months almost feels like time is standing still. Who’s with me? Not only do the winter blues get the best of my productivity, but these frigid days also take a toll on my skin. I have normal to dry skin most of the year, but when the colder months arrive, my normal skin likes to take a turn to EXTRA dry. So today I’m sharing 6 products that I’ve been using religiously this winter. I really use these products year round, but if you’re prone to dry skin, like myself, give these a whirl and I promise they won’t disappoint. I would bathe in coconut oil if I had the means to do it, haha. 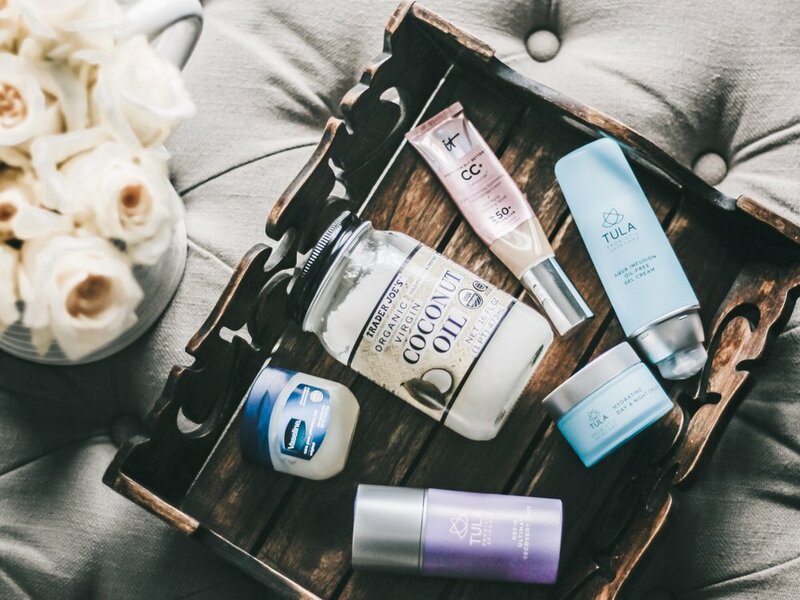 Since I have a few KILLER skincare products for my face that I’m sharing down below, I really just apply the coconut oil from my neck all the way down to my toes! A little goes a long way, and it keeps my skin so much more hydrated than any kind of lotion I’ve tried. If I’m in a hurry and don’t want to feel too oily throughout the day, I’ll apply my Aveeno lotion after I shower in the morning, but I always use coconut oil at night before bed. It’s a great way for it to just settle in my skin overnight and work it's magic for several hours. I usually get mine from Trader Joe’s, but you can really find organic/raw coconut oil just about anywhere these days. After washing my face with the Tula Purifying Cleanser (I use it morning and night), I apply their Aqua-Infused Gel Cream. It is VERY lightweight, and kind of just melts into your skin. I use this product first because it is lightest and it will absorb easier if it’s applied this way. I wait about 30 seconds for it to fully absorb and dry before moving on to step 2. This product leaves my skin feeling hydrated and glowy! Like the face wash, I use this morning and night. When my face is feeling extra dry and needs a little more TLC, I’ll use this mask on top of the day & night cream. Again, a little goes a long way just like all of these products, but I can’t tell you how moisturizing this product is- it’s amazing! Per the directions, it says to apply and leave it on for 10 minutes before using a damp cloth to remove the excess, but honestly, I’ll just apply this at night and leave it on while I sleep. I wake up to my skin feeling SO good! *I just apply at night, not part of my morning routine. This post is not sponsored by TULA, I just genuinely love and use their products. TULA was nice enough to provide me with a coupon code for my readers to use if you’re interested in trying any of their products. Use code BRONWYN for 20% off- including their starter kits! Changing gears just a bit with this makeup product, but I absolutely SWEAR by this CC cream. It’s the only foundation I’ve used for the past 3 years, and not only does it do wonders during the summer because it has SPF 50 and it’s lightweight, but it’s also a hydrating foundation which is perfect for winter. One all over application is great for a very natural make-up look, but I typically will apply twice for a more full-coverage look. What skincare products do you use to combat dry, winter skin? I’d love for you to share any recommendations in the comments below. I’m always looking for new products to try!